Ima Golden Girl | Nan Tubre Writes . . .
Oh. My. Gaaaaaa. Now it’s getting real. I’m afraid I must face the reality that I have become a senior citizen. Of course, I have been eligible for quite a while but it somehow seemed to be a projected image, not reality. Now I know for sure it is true. How can I tell, you ask? Let’s talk about aches and pains. Knarly knuckles. ‘Naturally’ frosted hair. Melting facial structure. Semi-crooked stance. The reluctant surrender to sensible shoes. When did it happen? How can I fix it? I’m pleading with Father Time….wait! not so fast! I’m so surprised. I thought I was immune to that process. I can’t stop it but all is not wasted; surprisingly I may have learned to enjoy it. In fact, this time in my life is the best. There are certain perks about senior citizenship, I promise. Take discounts. Oh yeah, I’ll take a discount! And the fact that life’s little dramas are less dramatic*. And respect (for the ‘elderly’) seems to come from out of the blue. I like that. I admit secretly I’m pretty tickled when some salesperson, hostess, or anyone younger than me calls me ma’am. I don’t pay any attention to the younger ones who audaciously roll their eyes at me. They will get it soon enough, might as well enjoy the moment of thinking they know it all. They don’t, and that, my friends, is a highly revered truth known to senior citizens everywhere. A long time passes before their folly is realized, but trust me, realized it will be. *About life’s little dramas…a couple of weeks ago I took a fall down the steps of my deck and landed on my apparently well-padded chest. You know how some things seem to happen in slow motion and a million thoughts flash through your mind in a split second? My falling thoughts went like this: “I could break a hip. My teeth! Please don’t break! I could smash all my teeth on the concrete. Oh well, I’ll get dentures.” Yes, those were my thoughts. It’s embarrassing. I don’t care what anybody says. The golden years are a blast. A woman really comes into her own later in life. There’s something about being closer to the end than the beginning that spurs her into doing as much as she can while she’s here. That’s how I see it. In fact, that was one motivating factor when I wrote SECRETS OF THE OLD LADIES’ CLUB. I wanted to tell everyone that life doesn’t end with the proverbial senior citizen discount. It really just begins. 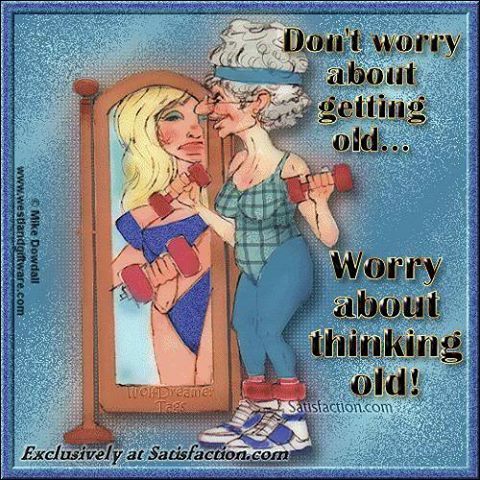 Oldage, as opposed to old age, gives a person permission to have fun and do what they want. Learn to play the piano! Create new neuron pathways in the old brain! Love richly in the way that only age and experience can teach! She was something, that old gal! Ok ya’ll, don’t forget to pray for peace! And I also love being a senior citizen. Of course I don’t act like one most of the time and that is what is so much fun!! !